Congratulations! The biggest day in your life comes closer. At Limotions Wedding Limo service we understand that your wedding day is one of the most important days of your life and you want it to be perfect. Your Wedding Limousine provided by Limotions is one item that will be worry-free. Book your Wedding Limo and your Bachelor/ Bachelorette party Limo with us and get a 10% discount! 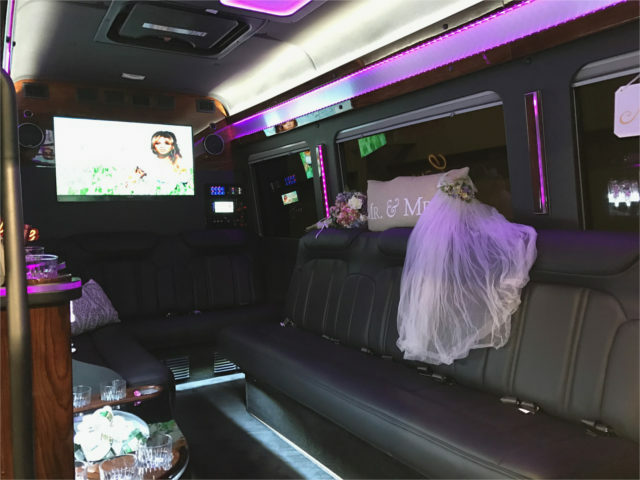 The Limotions Team works closely with you to provide the best Wedding Limo in Fort Myers and Cape Coral solution that fit your specific needs. With our luxury Limousines, you will get to the church on-time, relaxed and in comfort. Also, our beautiful Limos are a great scenery for your Wedding photos. We have years of experience catering to the needs of Wedding parties and enjoy the opportunity to provide extra-special moments and memories on your big day. We are the right choice for a Wedding Limousine around Ft. Myers, Cape Coral, Naples and surrounding areas. Limotions focus on excellent high-quality Wedding Limo transportation. Our reliable and top maintained vehicles are absolutely clean. Your courteous chauffeur comes dressed appropriate and rolls out the red carpet for you. The only thing you need to do is enjoy "the day of your life". The Limotions Team prides themselves not only offering the very best Limousines available around Fort Myers, Cape Coral and Naples but unequaled customer service as well. Your Wedding Limousine will arrive on-time, fully detailed and stocked with complimentary amenities. What our customers say - Top rated at Weddingwire!